Obituary for Beltha Birks | King-Tears Mortuary, Inc.
Beltha Birks, 95, passed away on April 2, 2019. He was born on July 11, 1923 to the late Louis and Johnny Birks in Mississippi. He is preceded in death by his wife of 39 years Zenobia Birks. Buddy accepted Christ on April 12, 1998, along with his wife Zenobia. He worked in the factory industry until he retired and moved to Austin, TX in 1986. You could find him humming and fixing just about anything. He was a jack of all trades and master of most with just a 3rd grade education. 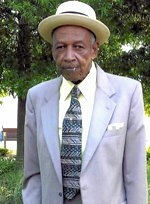 He is survived by his granddaughters DeAnna Bowens (Wylie), and Angelique Banks of Virginia Beach, VA, and Dana Craft (Edmond) of Jacksonville, FL; grandsons Leonard Banks III (Rachel), and Garland Banks of Austin, TX; sister-in-laws Vernestine Banks of Chicago, IL and Sandra Northern of Virginia Beach, VA, and a host of nieces, nephews, great grandchildren, great great-grandchildren, cousins and other loving relatives and friends.